We make great computers. They’re beautifully designed, simple to use and user-friendly. Wanna buy one? An Apple product isn’t just a computer, or a phone, or an MP3 player, it’s an ethos. So what does this have to do with Catholicism? We exist because Jesus Christ, the only-begotten Son of God, became incarnate of the Virgin Mary to die for our sins, to conquer death, and to establish a means of salvation in this world so that we can know God, love Him, and serve Him in this world and be happy with Him in the next. We believe that God loves every person, and actively wills and desires that they become saints. We believe that He has entrusted us with the mission of bringing those souls to Him, which is why every cathedral we build, every artwork we commission, every piece of sacred music we compose for the Mass, every theological exposition we write, every liturgy we offer, and every sacrament we dispense all have no other purpose than this: to cause men to reflect upon the majesty of Our Creator and to inspire them to live the kinds of lives that will allow them to be with Him in Heaven. We will not rest until we have brought the Good News to every corner of the world, because we know that outside of this institution established by and united with Him, no man can be saved. We could probably tweak it a bit, but as a working draft, I think it covers the bases. And I would propose to you that all the problems we’re facing now with the Church — every. single. one. — can all be traced back to the abandonment of that why. Whether it’s due to fear, embarrassment, disagreement, a sense of futility, or outright contempt for the beliefs expressed above, the “executives” of our “company” no longer believe in what they’re selling, and they have consequently lost the ability to inspire others to join them. On the other hand, if you’ll allow me to continue with the business metaphor, there are a core group of “employees” and even a couple folks in the “C-Suite” who have never lost their passion for the why of Catholicism. They live it. They breathe it. They love it. And they know that the only way to get back on top is for every member of the organization to embrace it again, and to share their passion for it with the world. That, my friends, is us. You. Me. The four dubia cardinals. The loud but lonely voices in the Catholic media and blogs crying out against what is happening in the Church. The 45 theologians. The countless priests who are fighting every day in the trenches of the confessional and the pulpit to hold the line on what we believe and why we must honor it. The families having children and offering them to God to become priests and nuns. The spouses caught up in divorce against their will who nevertheless honor their vows and the 6th Commandment and offer up their struggles and their suffering to Our Lord, no matter who tells them they don’t have to. We are vastly outnumbered, but we have something they don’t: we believe in what we’re doing with the kind of passion that is only possible when we know it has been ordained from on high. We already have the assurance of victory. We just have to keep duking it out until we get there. Howard understood from a very young age the very human desire to win. No one likes to lose, and most healthy people live their life to win. How often have you felt this way? When you read that the dubia Cardinals are practically begging for scraps from the papal table, when you see them renew, in writing, their “absolute dedication and our unconditional love for the Chair of Peter and for Your august person, in whom we recognize the Successor of Peter and the Vicar of Jesus” when he won’t even give them the time of day, when people admonish you for being too critical about what’s going on without acknowledging that what’s going on is the problem and you are just pointing it out, doesn’t it sometimes feel like you’re being told that the only thing that matters is how we play the game? Finally, brethren, be strengthened in the Lord, and in the might of his power. Put you on the armour of God, that you may be able to stand against the deceits of the devil. For our wrestling is not against flesh and blood; but against principalities and power, against the rulers of the world of this darkness, against the spirits of wickedness in the high places. Therefore take unto you the armour of God, that you may be able to resist in the evil day, and to stand in all things perfect. Stand therefore, having your loins girt about with truth, and having on the breastplate of justice, And your feet shod with the preparation of the gospel of peace: In all things taking the shield of faith, wherewith you may be able to extinguish all the fiery darts of the most wicked one. And take unto you the helmet of salvation, and the sword of the Spirit (which is the word of God). By all prayer and supplication praying at all times in the spirit; and in the same watching with all instance and supplication for all the saints: And for me, that speech may be given me, that I may open my mouth with confidence, to make known the mystery of the gospel. For which I am an ambassador in a chain, so that therein I may be bold to speak according as I ought. This is a real battle. And battles are fought to be won. On December 5, 1914, Shackleton and a crew of twenty-seven men set out for the Weddell Sea on the Endurance, a 350-ton ship that had been constructed with funds from private donors, the British government and the Royal Geographical Society. By then, World War I was raging in Europe, and money was growing more scarce. Donations from English schoolchildren paid for the dog teams. But the crew of the Endurance would never reach the continent of Antarctica. Just a few days out of South Georgia Island in the southern Atlantic, the ship encountered mile after mile of pack ice, and was soon trapped as winter moved in early and with fury. Ice closed in around the ship “like an almond in a piece of toffee,” a crew member wrote. Shackleton and his crew were stranded in the Antarctic for ten months as the Endurance drifted slowly north, until the pressure of the ice floes finally crushed the ship. On November 21, 1915, the crew watched as she sank in the frigid waters of the Weddell Sea. Stranded on the ice, the crew of the Endurance boarded their three lifeboats and landed on tiny Elephant Island. There Shackleton left behind all but five of his men and embarked on a hazardous journey across 800 miles of rough seas to find help. Which, eventually, they did. What makes the story of the Endurance so remarkable, however, is not the expedition, it’s that throughout the whole ordeal no one died. There were no stories of people eating others and no mutiny. This was not luck. This was because Shackleton hired good fits. He found the right men for the job. And how did Shackleton find those men? With an advertisement in the London Times. Unlike typical jobs ads that outline required skills and experience, Shackleton knew what kind of men he needed to find, and spoke to their inner fire. 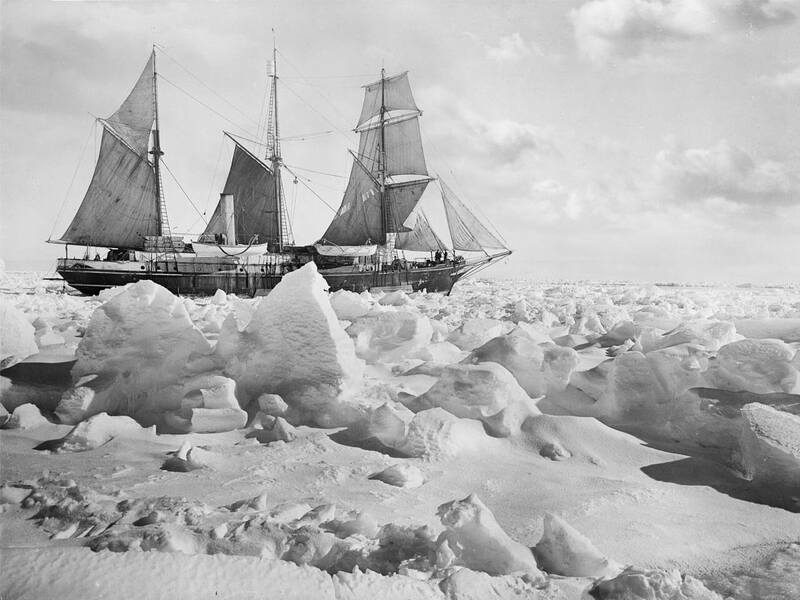 If you’re here, and you’re reading this, it’s because like Shackleton’s men, you’re a survivor. You are not on this journey, as the Barque of Peter drifts dangerously close to the shoals, weathers tempests, or finds itself moored in ice, because you are blind to the dangers. You do not sit in your cabin enjoying delusions that you are experiencing smooth sailing under sunny skies. You are not running to the deck rail, ready to throw yourself overboard because you cannot bear the thought that your captain, whom you trusted, has led you into dangerous waters. You know that the odds are insurmountable, but you believe in the voyage. And because you believe, you’ll find a way through. God didn’t place an ad in a newspaper or on Craigslist to find you. He did, however, give you life at this incredible moment of history. He called you to the Catholic Faith. He instilled in you an instinct for truth, and an ability to discern it from more popular and comforting fictions. He reached out and chose men and women who had eyes to see, and He opened them. And you answered His call, no matter the risk, because you believe. Though Sinek doesn’t mention it, Ernest Shackleton never completed his quest. After returning home from the failed 1914 expedition, he tried again in 1921, only to die of a heart attack en route. Some of us, too, may not live to see the Church restored. In fact, it’s possible that none of us will. Does that mean that we should give up, go home, and find some nice, peaceful, and far less stress-inducing way to spend our days? Could any of us even do that if we wanted to? Could we live with ourselves? Would it be possible for you to return to an anodyne existence, blithely ignoring what may well be the most important battle in history? A battle for the very heart of the Church, and the souls she exists to save? There is no human reason to believe that we will prevail. But this is no merely human institution we are fighting for. But it is critical to remember that what we are doing, all of us, is building a cathedral. And that means something. When the history of our age is written, people will look back and see that there were those who stood fast. Who did the work, day by day, of documenting and opposing the activities of the enemies who have invaded His Mystical Body like a cancer. Who continued to teach the true faith. Who retained their love of God and his Church and the countless souls being led astray, and who, despite the weight of their temptations to despair and their own innumerable sins, pressed on. Your prayers, your sacrifices, your Masses, your rosaries, your efforts wherever you go to live the faith and to “be bold to speak according as you ought” — these are the stones of the cathedral that is being built. These are the work of restoration, and it will be realized some day, even if the project is not completed in your lifetime. When it comes right down to it, there’s only so much you and I can do. We cannot fix what is broken in our beloved faith. We do not have the power or the means. In fact, I would venture to say that at this point, as I’ve said before, there is most likely no human solution. But God is not constrained to human means. It is His faith, His Church, His bride. He has allowed her to endure great torment, to share in His passion, but He will not leave her to perish under the blows of her enemies. He has promised us that the gates of hell will not prevail, and though it may appear that she has died, He will raise her up again, just as He himself did on that first, glorious Easter. Is Amoris Laetitia an Expression of the Ordinary and Universal Magisterium?